Private jet in the Midsize category and upwards feature a separate washroom, which means you can easily freshen up during your flight. It is well known that the atmosphere in a cabin can be extremely drying, so its advised to stay well hydrated - which applies for your skin too. Why not sit back and enjoy your time in the air and use a moisturizing mask to rejuvenate your skin. A facial oil can also help to keep the skin feeling supple and hydrated. Towards the end of the flight you might want to freshen up with a cleanse and quick brush of your teeth. In addition to the comfort of being able to relax in the privacy of your own cabin, the controlled cabin pressure in a private jet can help reduce the effects of jet lag. In our digital-centric world, most of our lives are run through some kind of technology – be it a phone, tablet or laptop. A powerful travel charger means that wherever you travel to in the world, you can rest assured that you can stay connected - especially longer distances. Claimed to offer the quickest recharge on the market, the Raypower Turbo 20100 Power Bank offers 10 mobile phone charges and 3 USB ports for simultaneous charging. The large capacity and rapid recharge of this device is invaluable when you don’t want to worry about finding the nearest power source or the correct travel adapter. A very standard and essential travel item revolutionized into a self-sufficient, moving gadget. Cowarobot R1 showcases the cutting edge of technology that allows it to follow tracks autonomously. Using the power of multi-sensor fusion technology and a robot motion control algorithm, it will roll behind you in your tracks so you have enjoy traveling hands free. Based on its technological sense of ‘vision’, the robot will find an optimal path to walk along with the user and avoid obstacles. This means you can forget about pulling along a heavy suitcase (although, there isn’t too much pulling to be done once you arrive at the private terminal) and stroll around with peace of mind that your suitcase is right behind you. To make the most of all its features, there’s an app you can download to control smart locks, record and share the traveling path and monitor the status of the suitcase. Importantly, it also incorporates multiple security measures and digital device charging. 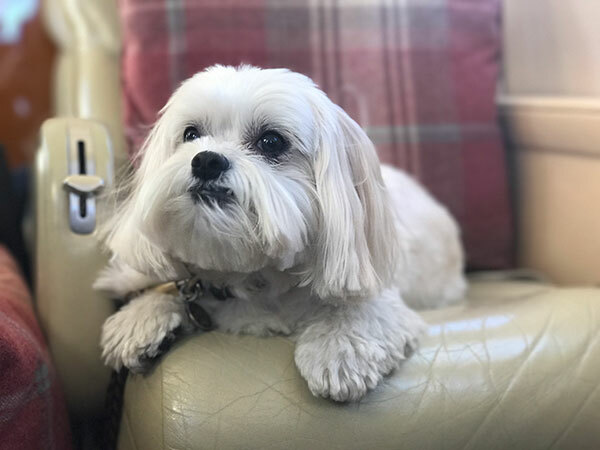 Private jet charter is often the easiest option when traveling with your four legged friend, with peace of mind that they are having a comfortable and stress-free journey. Its worth getting used to traveling with a couple of items that are often required by operators when dogs are on-board. The first is a muzzle – a required item for any medium or large sized breed, no matter how friendly they are! The second is a seat restraint – just like us, its important that your dog travels safely and is strapped in for take-off and landing. Regulations on pets flying do vary according to the aircraft operator, but our team of experts will advise you on the best option for you and your animal companion when flying.